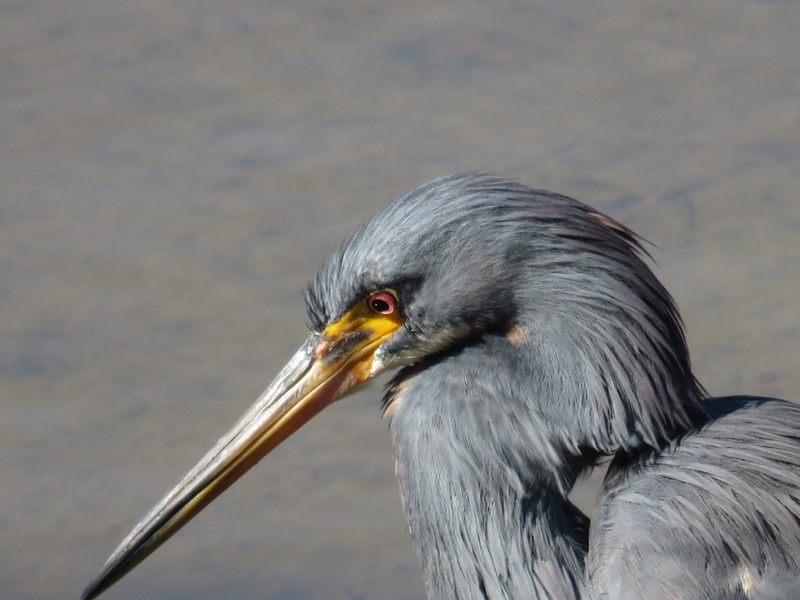 On a brilliantly sunny Sunday morning, I took a guided kayak trip through the marshes of St. Simons. I felt guilty because George couldn’t come too, but he is slowly ramping up his activities after shoulder surgery and was not yet ready for kayaking. He thoughtfully bought me the trip for a Christmas present, even knowing that he would not be able to come along. So, I took full advantage of his kindness, headed out without him, and had a wonderful time. 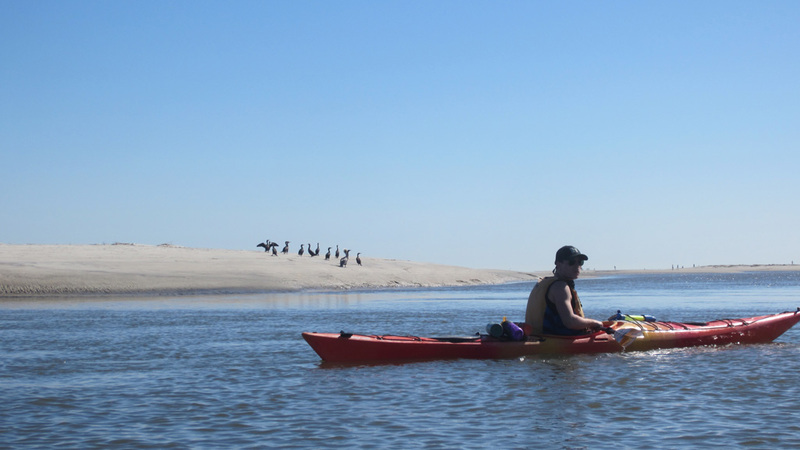 It’s off season here and there were only four of us—the guide, me, and a couple from the Eastern Shore of Virginia–all experienced kayakers. 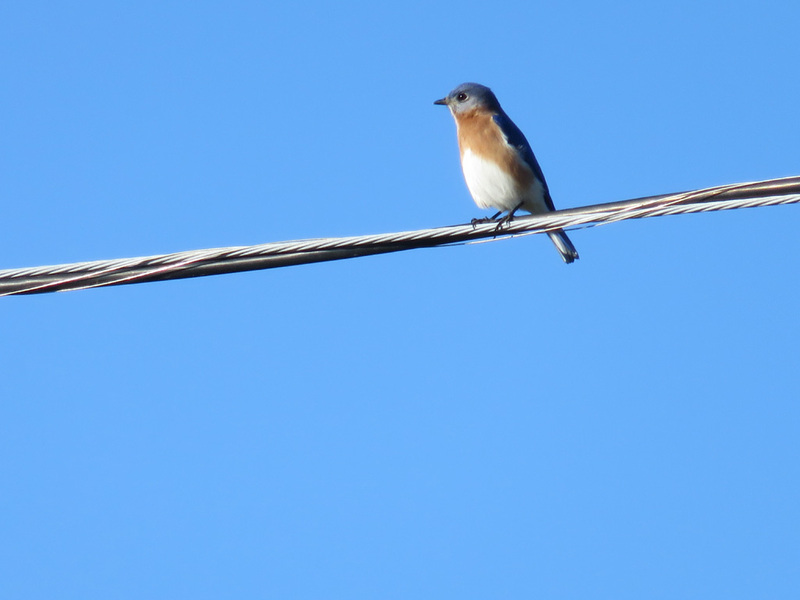 We put our kayaks in at the East Beach Causeway over the marsh–a favorite perch for bluebirds on the overhead lines. Our starting place. No wilderness here, but a vibrant ecosystem, full of life and history. 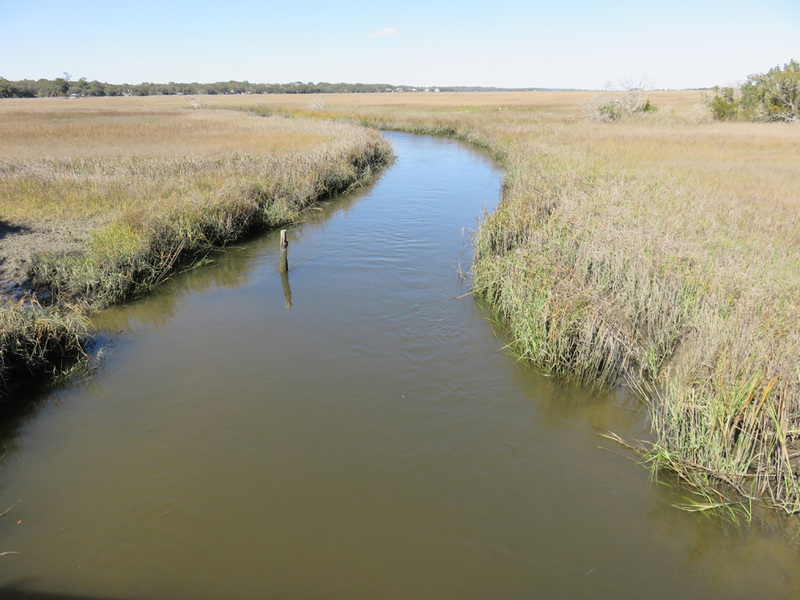 We paddled through the estuaries, winding along black muddy banks of Spartina grass. 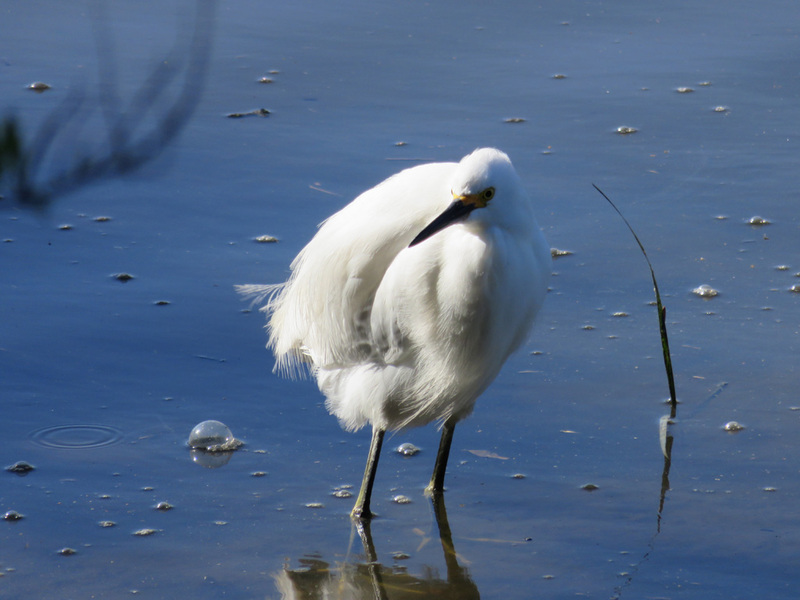 It was a bit disconcerting to be so low in the marsh and unable to see over the grasses. Such a limited view makes you feel unexpectedly vulnerable. There is marsh life going on all around you, but you cannot see anything but the bit of water in front and behind you and a patch of sky. 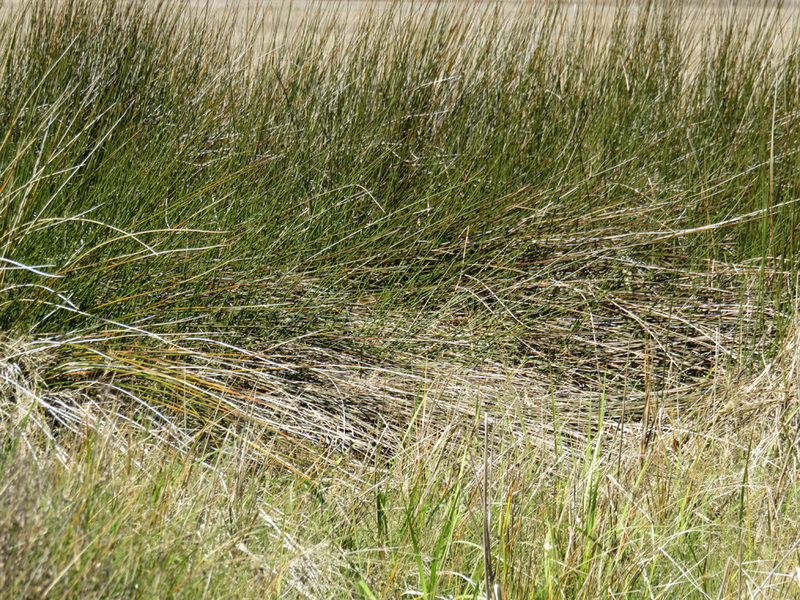 Lots of marsh grass, greening up as spring approaches. 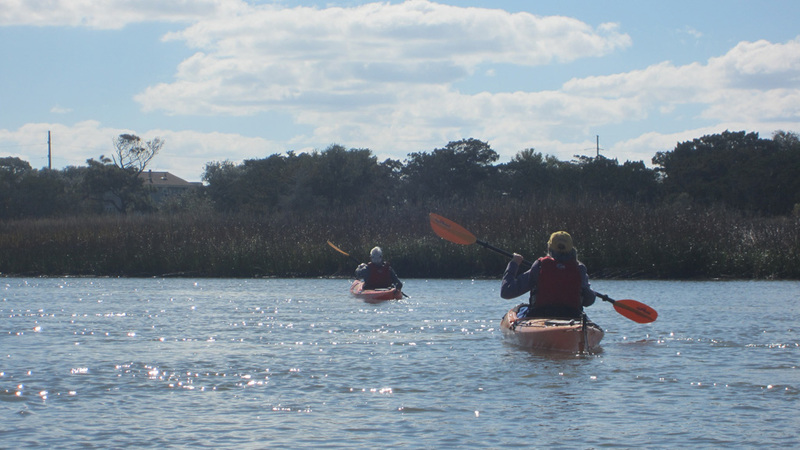 We rafted our kayaks in a slow bend of water for a brief history lesson at Bloody Marsh, the site of a (not so bloody) skirmish between British troops on St. Simons and invading Spanish, during the War of Jenkins’ Ear in the 1740s. Any war named after a body part has my attention. The Ear war was part of an ongoing conflict between the British and the Spanish over territory and power in the Americas. Britain had been given a contractual monopoly on the African slave trade in the Spanish Americas, but the Spanish believed that the British were using the contract to smuggle in trade goods, and started boarding ships and confiscating cargo (the British were engaged in their own piracy, too). Jenkins, a British privateer, had his ear cut off by the Spanish as a warning—(“Send it back to your king, amigo, aaargghh!”). The story goes that Jenkins brought the ear back to Parliament and its grisly presence whipped up sentiment for war against the Spanish. The Battle of Bloody Marsh cemented Britain’s hold on the Georgia. After the intriguing history lesson, we continued on, eventually hearing the crash of surf as we emerged to open water at Gould Inlet and headed toward the beaches. Because we made good time, we were able to take a side trip across to the spit at the end of Sea Island–the rich beach. Sea Island lies right next to St. Simons, but the whole island is gated and only accessible to residents and their guests (which presumably includes “the help”). I have been informed several times since we have been on St. Simons that Sea Island is one of the wealthiest zip codes in the country. For some reason, people seem proud of this fact, as if it is an attribute to live near the immensely rich and famous. 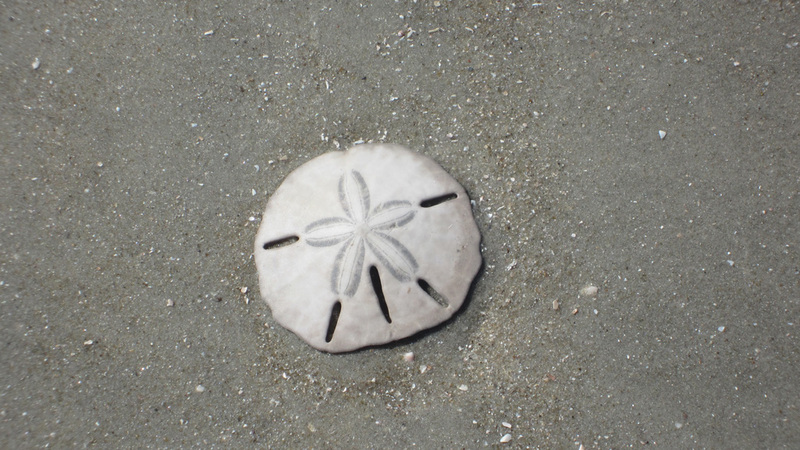 Even the sand dollars head in this direction. So, the riff raff cannot get on Sea Island by car, but can sneak in by kayak. Georgia’s beaches are public up to the high tide line, so we landed our kayaks on the spit and walked the beach. Remarkably, because it was a gorgeous early spring day, with welcome sunshine after some significantly cold weather–we were the ONLY people on the beach. Perhaps the very rich only need to know the beach is there—empty of hoi polloi—and don’t actually spend time on it themselves. 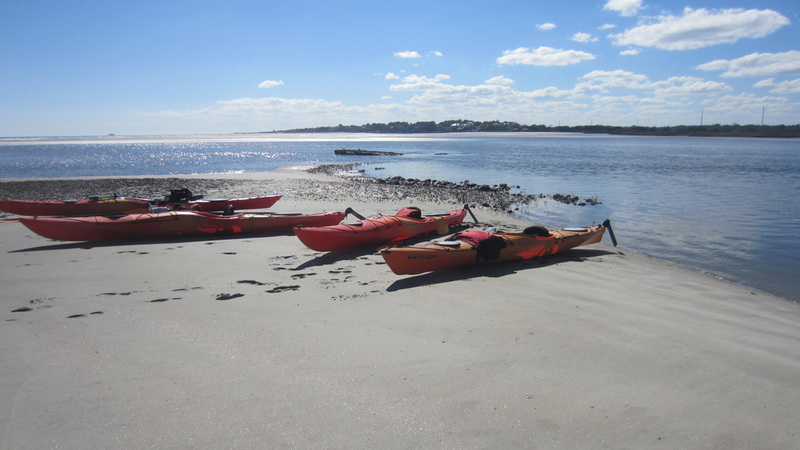 After exploring the beach a bit, we returned to our kayaks and paddled across the inlet to the somewhat less affluent world of St. Simons. 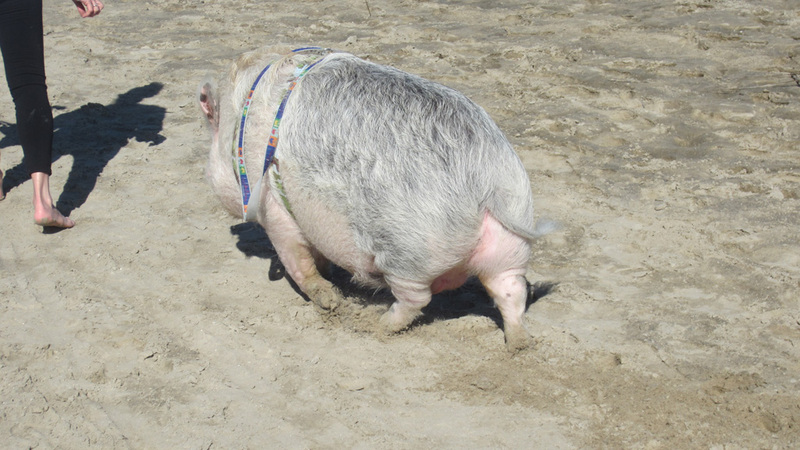 There the beach was full of people and one very fat pig, with a shell-like sow’s ear . Next time, George comes too. 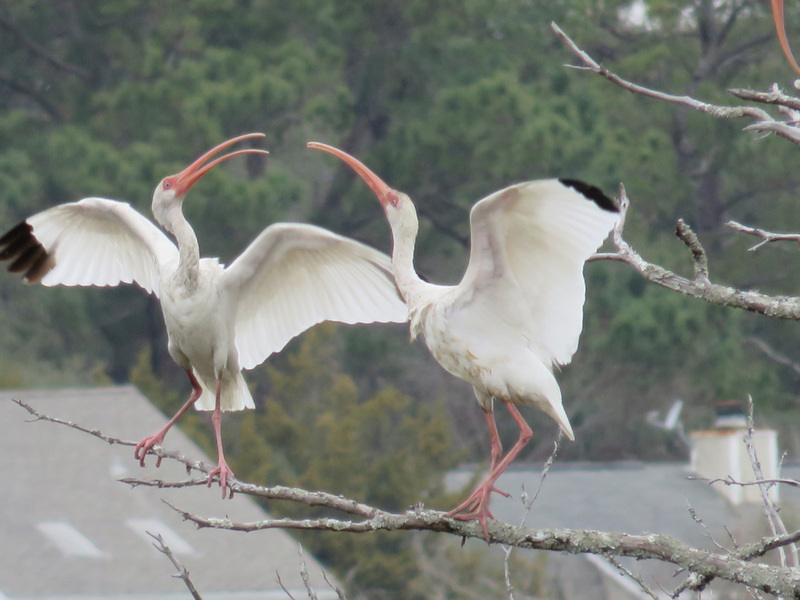 This entry was posted in Coastal Georgia, Georgia, Road trip, Rving across the country, St. Simons Island and tagged Battle of Bloody Marsh, kayaking, pig on the beach, Sea Island Spit, St. Simons, War of Jenkins' Ear by Brenda. Bookmark the permalink. You would think so, wouldn’t you? But history does repeat itself … I was fascinated by the use of propaganda to gain support for war–Jenkins’ ear was the equivalent of our “weapons of mass destruction,” except his severed ear actually existed! And thanks for commenting (and the nice words). What a great way to spend a lovely spring day. That pig intrigues me, was he some ones pet? I cannot think of a better way to spend the day than in a boat on the water. I especially love to kayak and sail. 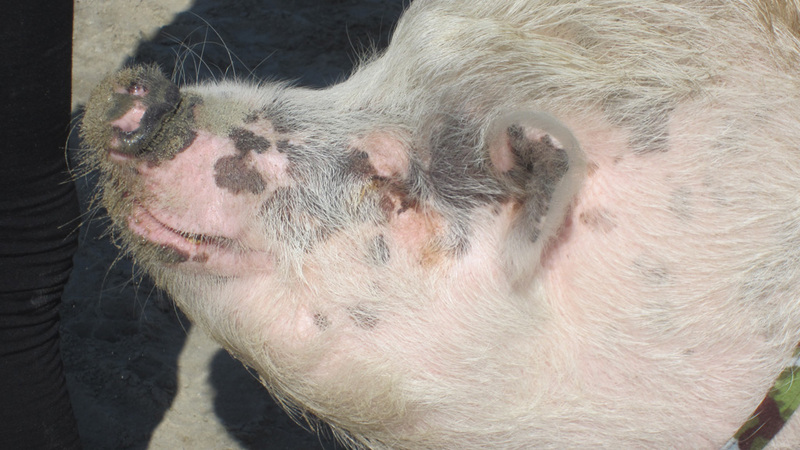 The pig is a pet potbellied pig from St. John in the Virgin Islands. His name is Ziggy and he has his own facebook page. He was waddling around the beach, happy to visit with everyone passing by. I haven’t had much experience with pigs, but became enamored with cows when we stayed at a cottage on a ranch in Maui and we got to watch the daily cow social interactions from our porch. Does your love affair prevent you from eating pork? Well no I actually used to be given pork and bacon from the farm I worked on each Christmas. Though now a days I don’t eat much meat at all. I also milked cows in the Waikato NZ for nearly 12 years. All just memories now. Glad George will be up for it again. Liked the history lesson. I’m glad you enjoyed the history–this area has more than its share of quirky history. George is recovering quickly and should be up to full activity soon. Thanks Beth! 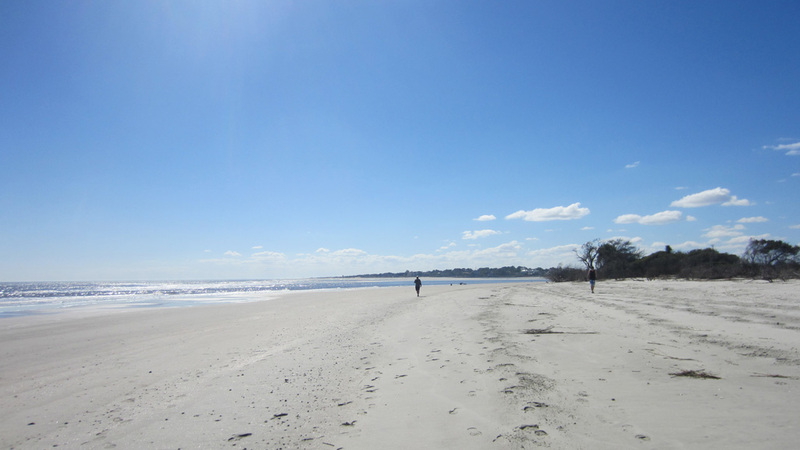 Did you spend any time on Sea Island when you lived on St. Simons? 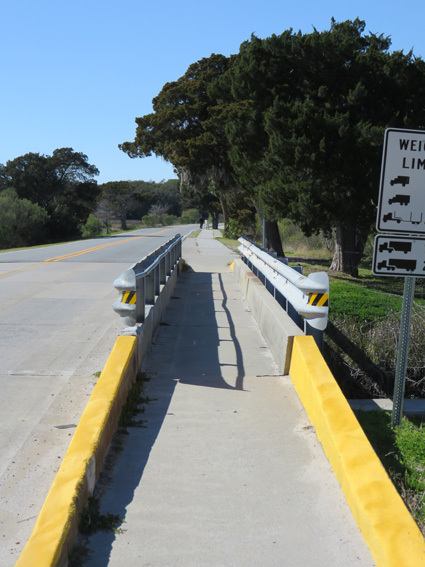 Was it accessible to everyone then? I remember driving around and looking at the houses on Sea Island but we couldn’t park and go to the beach. I didn’t know until I read your post that people can’t do than any more. 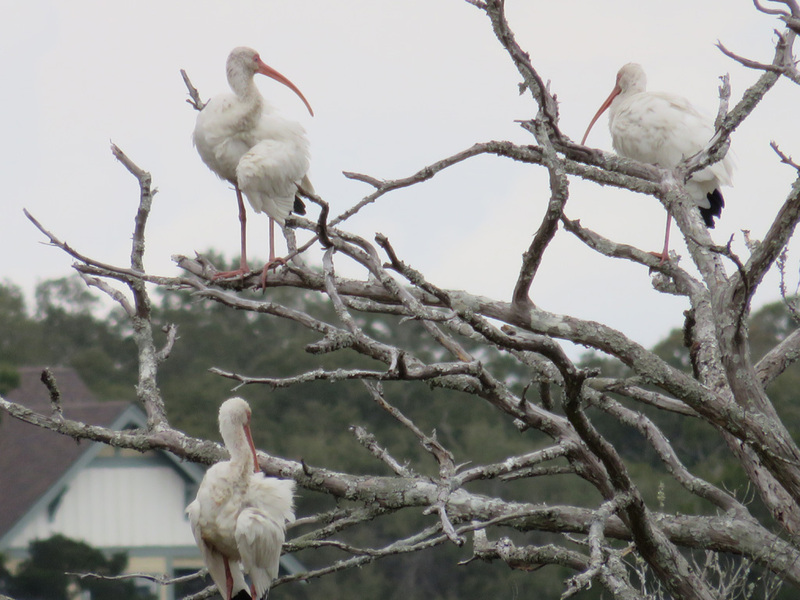 There used to be a spit of land between St. Simons and Sea Island called Pelican Spit. We used to take our boat there and spend the day. I don’t think it was connected to Sea Island back then. I wonder if it is the same spit you went to. 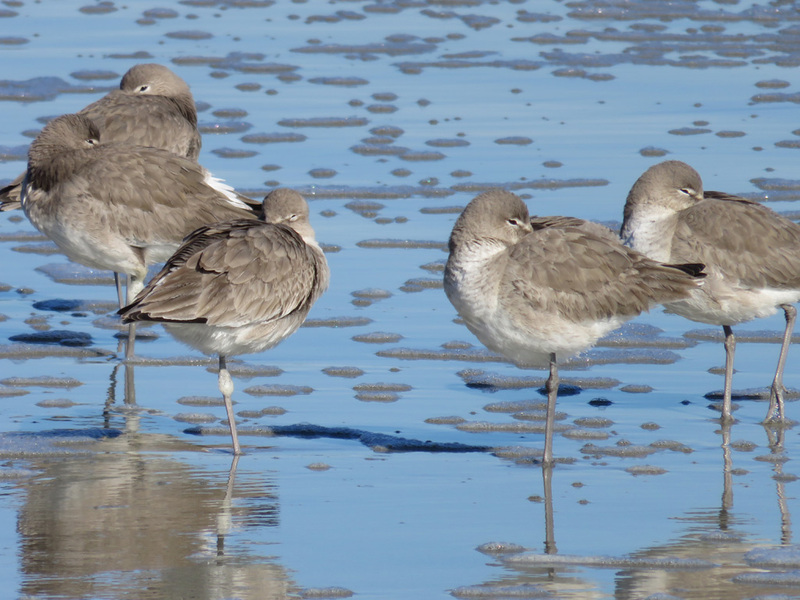 I understand that the sands and spits between Sea Island and St. Simons have changed a lot in the past 5 years, so its possible that Pelican Spit morphed into the spit we were on. That’s what I was thinking. The sand along the Georgia coast is constantly moving and changing location. Thanks for reminding me again of the fun times we had when we lived there. The beach looks very peaceful ! You know, it was almost creepy, it was so deserted. 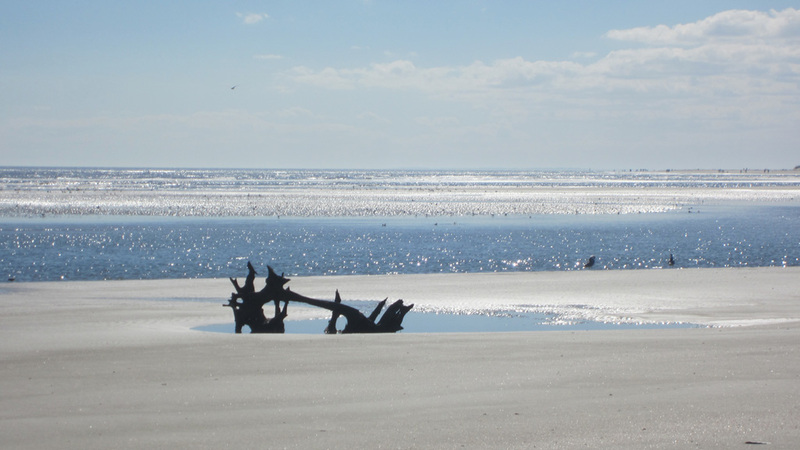 The beach at St. Simons was bustling that day and the Sea Island beach felt strangely post-apocalyptic by contrast. But it was lovely. Alaska is a magical place for kayak trips–such a huge variety of places to explore. We had a two-person kayak when we lived there and used to take our dog Zoe with us. But, I agree that you want to be able to see what is ahead of you in bear country, especially in salmon season. I am really enjoying your blog posts on Alaska. It was kind of a magical day. Topped off by the pig on the beach.